Will Global Debt Expansion Trigger the Next Financial Downturn? In the 10 years since the 2008-2009 global financial crisis, aka “Great Recession,” the global debt of the non-financial sector increased by 53 percent to reach $178 trillion in the third quarter of 2018, according to the Bank for International Settlements. 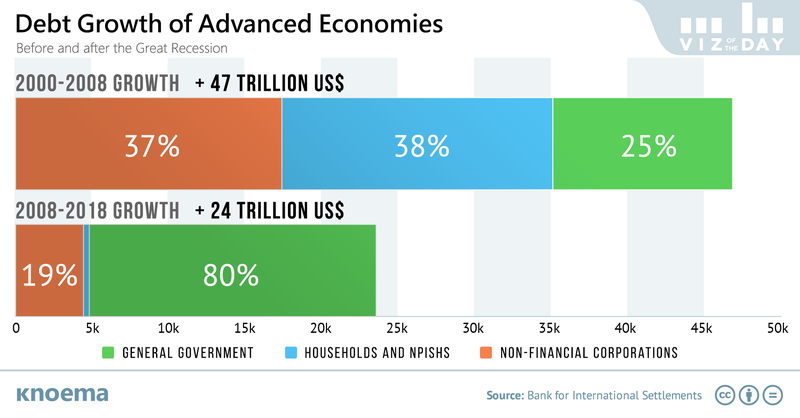 Global debt, which represents the outstanding credit provided by domestic banks and other institutions to households, non-financial corporations, and government, is quite simply the driver of the modern economy. Over the 2008-2018 period, each percent of GDP growth in G20 countries required, on average, 1.6 percent of debt growth. Government debt in advanced economies and the debt of non-financial corporations in emerging economies is behind this increase in post-crisis debt. This is a marked difference from the pre-crisis period surge in the household and non-financial corporations debt in advanced economies (leading ultimately to the housing market collapse and resulting global contagion). Uncontrolled debt growth of this nature may cause a myriad of problems locally and globally, however, several factors suggest that the next financial downturn will be less severe. Household debt growth in advanced economies, which was the primary reason for the 2008 financial crisis, has decelerated compared to the pre-crisis period. Whereas during the eight years before the crisis the debt of households soared 105 percent in advanced economies, in the 10 years after the crisis, household debt rose only 5 percent. In the Euro area, the debt of households even contracted by seven percent. Within the new emerging market debt, the growth in Chinese corporate debt stands out, surging almost three times since 2008. But, since Chinese companies borrow primarily from domestic institutions, it is less likely that defaults of Chinese corporate debt would lead directly to a global economic downturn. Only government debt has continued unchecked since 2008. Still, as long as investors around the world are confident in the government debt of major advanced economies, the growth of government debt is not immediately dangerous either. So, where then should there be cause for concern if in fact a crisis is inevitable, cyclical even? We're keeping close tabs on China. The structure and volume of its external debt, among other factors, may be the trigger for an economic recession in China causing far reaching economic problems globally. Chinese Economy - a Bubble?